What is GeoLing and what does it do? 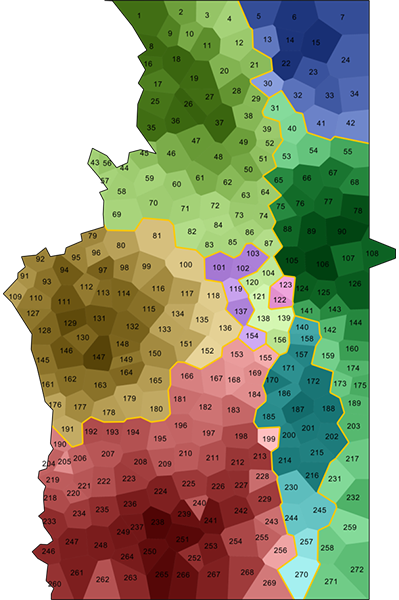 In short, GeoLing is a handy tool for performing statistical analyses on spatial data: You can use data from dialect surveys, transform them into smoothed maps (via density estimation), detect structures that run through the data and find groups of maps that share spatial features. We developed this program with linguistic applications in mind, but that should not stop you from using it for any kind of spatially conditioned data. The software is written in Java – as Java runs on multiple platforms, there is one version for all users. Please make sure that the Java version running on your machine is up to date; updates are obtainable at www.java.com. The latest version of GeoLing and the accompanying guide are always available on this site. Originally, the software was developed for and tested on the data of the Sprachatlas von Bayerisch-Schwaben (SBS). The corresponding database (that served as the basis for most examples in the guide as well) is supplied for demonstration purposes. GeoLing is ready to use after unzipping a single file; no installation is required. The guide includes a detailed section on how to import your own data sets. This software is licensed under the GNU General Public License v3.0 (published on 29 June 2007). The full text of GPL 3 is available at https://www.gnu.org/licenses/gpl-3.0. Although we took reasonable precautions and conducted extensive testing, we would like to stress that the software comes without any warranty or guarantee. J. Rumpf, S. Pickl, S. Elspaß, W. König and V. Schmidt, Structural analysis of dialect maps using methods from spatial statistics ( Preprint). Zeitschrift für Dialektologie und Linguistik 76 (2009), 280–308. S. Pickl and J. Rumpf, Automatische Strukturanalyse von Sprachkarten. Ein neues statistisches Verfahren ( Preprint). In: E. Glaser, J.E. Schmidt and N. Frey (eds. ): Dynamik des Dialekts - Wandel und Variation. Akten des 3. Kongresses der Internationalen Gesellschaft für Dialektologie des Deutschen (IGDD). (Zeitschrift für Dialektologie und Linguistik, Beihefte, 144.) Steiner, Stuttgart (2011), 267–285. S. Pickl and J. Rumpf, Dialectometric Concepts of Space: Towards a Variant-Based Dialectometry ( Preprint). In: S. Hansen, C. Schwarz, P. Stoeckle and T. Streck (eds. ): Dialectological and folk dialecto­logical concepts of space. Walter de Gruyter, Berlin (2012), 199–214. S. Pickl, A. Spettl, S. Pröll, S. Elspaß, W. König and V. Schmidt, Linguistic distances in dialectometric intensity estimation ( Preprint). Journal of Linguistic Geography 2 (2014), 25–40. S. Pröll, S. Pickl and A. Spettl, Latente Strukturen in geolinguistischen Korpora ( Preprint). In: M. Elmentaler, M. Hundt and J.E. Schmidt (eds. ): Deutsche Dialekte. Konzepte, Probleme, Handlungsfelder. Akten des 4. Kongresses der Internationalen Gesellschaft für Dialektologie des Deutschen (IGDD) in Kiel. (Zeitschrift für Dialektologie und Linguistik, Beihefte, 158.) Steiner, Stuttgart (2015), 247–258. J. Rumpf, S. Pickl, S. Elspaß, W. König and V. Schmidt, Quantification and statistical analysis of structural similarities in dialectological area-class maps ( Preprint). Dialectologia et Geolinguistica 18 (2010), 73–98. D. Meschenmoser and S. Pröll, Using fuzzy clustering to reveal recurring spatial patterns in corpora of dialect maps ( Preprint). International Journal of Corpus Linguistics 17/2 (2012), 176–197. 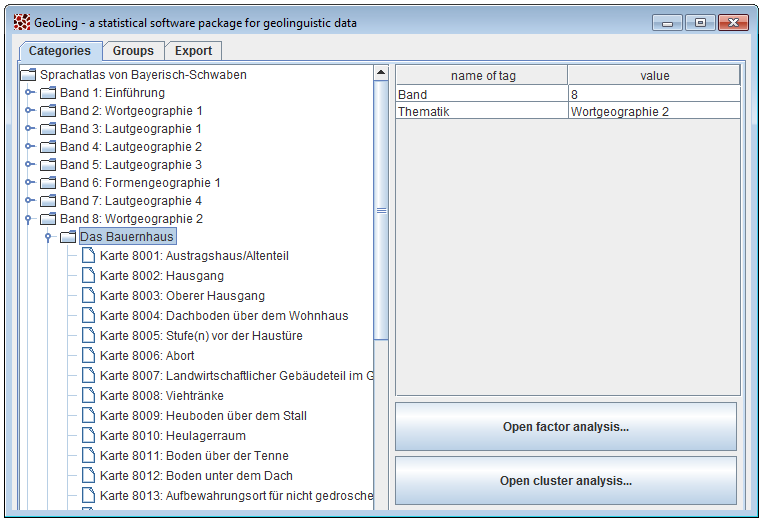 Figure 1: Screenshot of GeoLing after startup, where the list of maps is shown. Figure 2: Dominant factors as a map; obtained from factor analysis based on data from the example database SBS.